Singer, songwriter and producer Ellie Goulding has been awarded the United Nations Foundation’s New Voices Award in recognition of her environmental and social justice activism. 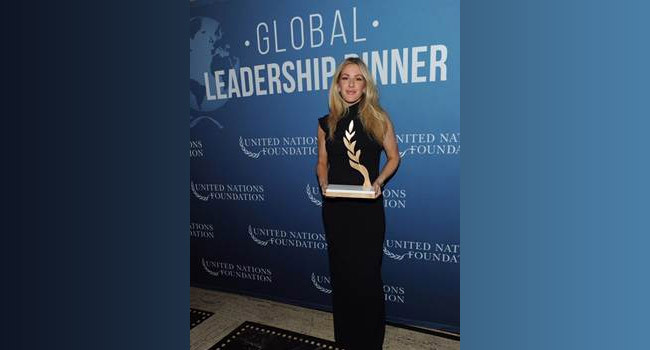 Accepting the award in New York from Munira Khalif, US Youth Observer to the UN, Ellie Goulding thanked the UN Foundation and revealed that in the New Year she will join the UN Family as a Goodwill Ambassador for UN Environment. In a heartfelt address to an audience that included United Nations Secretary-General Antonio Guterres, former UN Secretary-General Kofi Annan, Kathy Calvin, President and CEO of the UN Foundation and Daniel Craig, Actor and UN Global Advocate, Ellie Goulding spoke of growing up in the British countryside where she was able to nurture a love of and respect for the natural world. She explained how her environmental activism has intensified over time through education and access to compelling science and contrasted this with the experiences of some of her global audience, forced to confront climate change in dramatic and traumatic circumstances. She promised to fight for the right for young people to access meaningful environmental education and to have decisive voice and role in their future. In an earlier visit to the United Nations headquarters in New York, Ellie Goulding attended a panel session on climate action and was interviewed by Munira Khalif for Facebook Live.